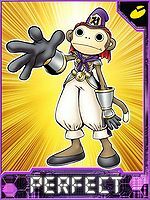 Difference between revisions of "Makuramon"
One of the "Deva Digimon", it is a Perfect Digimon with a form resembling the Monkey. 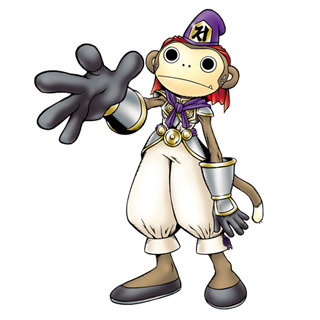 As a follower of the Four Holy Beasts Digimon Baihumon, it has a curious disposition of not speaking and not showing its emotions on its face. However, contrasted with its facial expressions, its body movements are overflowing and its emotions are expressed through its bodily poses. Those suggest that it is often in a more or less good mood, but that its overflowing curiosity doesn't last very long. It makes a hobby out of collecting and locking up the things that catch its eye in its Bǎo Yù, and in battle, it is a pacifist that locks up the opponent to settle its issues. Its Special Move is "Raurava", in which it crushes the Bǎo Yù imprisoning its opponent, completely erasing the opponent along with it. One of the "Deva", it is a Perfect Digimon with a form resembling the Monkey. 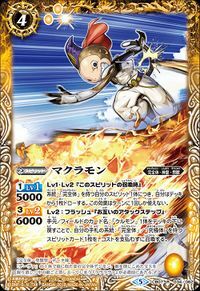 As a follower of the Four Holy Beasts Digimon Baihumon, it has a curious disposition of not speaking and not showing its emotions on its face. However, contrasted with its facial expressions, its body movements are overflowing and its emotions are expressed through its bodily poses. Those suggest that it is often in a more or less good mood, but that its overflowing curiosity doesn't last very long. It makes a hobby out of collecting and locking up the things that catch its eye in its Bǎo Yù, and in battle, it is a pacifist that locks up the opponent to settle its issues. | Makura (「マクラ」 Makura) is one of the Twelve Heavenly Warriors of Buddhist Mythology. Anime/Manga Digimon Tamers: "We Would Like to Become Strong! 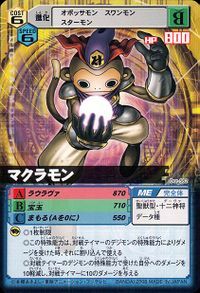 Rise Impmon"
Imprisons its opponent in a Bǎo Yù and crushes it, completely erasing them. 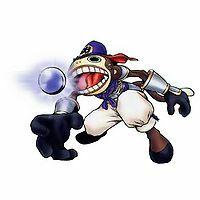 Bǎo Yù  Treasure Ball 宝玉 Pao Yū Primal Orb Throws an explosive crystal ball. 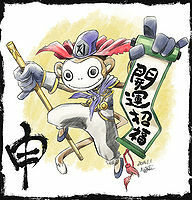 One of the Deva servants of Zhuqiaomon, Makuramon first appears in the guise of a young human boy to spy on the Tamers. In the frenzy of the Vikaralamon battle, Makuramon kidnaps Culumon and escapes into the Digital World. Makuramon is then on the run from the Tamers and is eventually killed and absorbed by a power-hungry Beelzebumon. 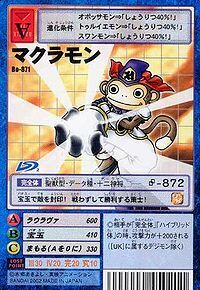 Makuramon can only be obtained as a collectible card. 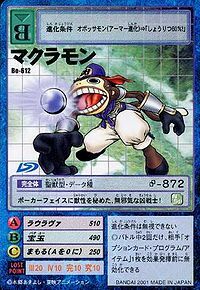 Its card is part of the Deva (十二神将（デーヴァ） Jūnishinshou (Dēva)) set and the Baihumon's Subordinates (バイフーモン配下 Baihūmon Haika) set. Makuramon is available as a Digimon Medal. 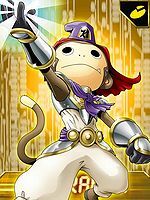 An innocent monkey god! It seals its opponents within orbs with a strange light ray!! It hides its brutality under its poker face, an innocent, fierce warrior! It seals its enemies in its Bǎo Yù! This schemer wins without fighting! 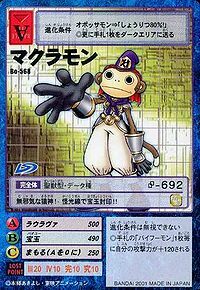 An agile monkey god with a poker face! 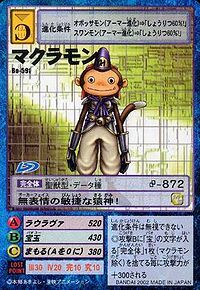 One of the "Deva", it is a Perfect Digimon with a form resembling the Monkey. Its Special Move is "Raurava", in which it crushes the Bǎo Yù imprisoning its opponent, completely erasing the opponent along with it. ↑ Internet Sacred Text Archive, retrieved 08/31/07; Vishnu Purana, Ch. VI: "The man who bears false witness through partiality, or who utters any falsehood, is condemned to the Raurava (dreadful) hell."